This is the view of the pool, barbecue and concrete pool slide, which is close to 20 feet long! We never planned it would be that big! And that little twist at the end will give you the ride of your life. It took a lot of stone to build up that little corner. Thankfully, we found a Craig's Lister in Malibu looking to get rid of river rocks on his property. We took two truck loads for free! The Gilligan's Island/Swiss Family Robinson-style railing was made quite frugally by using thick rope for the rails and a Cypress tree that had to be cut down on our property. When the waterfall pump is turned on, there's a stream that tumbles down over a stacked stone wall under the slide and into the pool. Water also flows down the slide for a double-cascade-effect. The water sounds lend an enchanted quality to the backyard, making us feel as if we've escaped into a secret hideaway far far away from Los Angeles. It's amazing to me that my office is only a mile away from here! 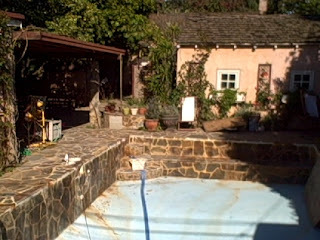 This is the after-shot of our backyard pool. From this view, we're looking at the back of the garage. To the left you can just make out the stone jacuzzi. 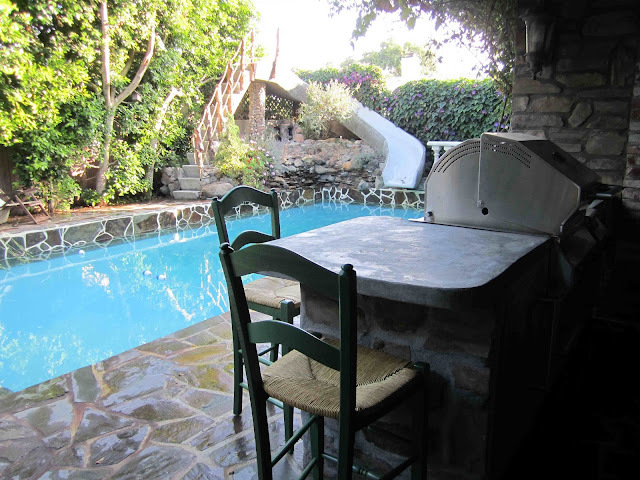 The guesthouse and outdoor kitchen are out of view, but situated to the left. And the pool slide and waterfall are situated just out of view in the foreground. 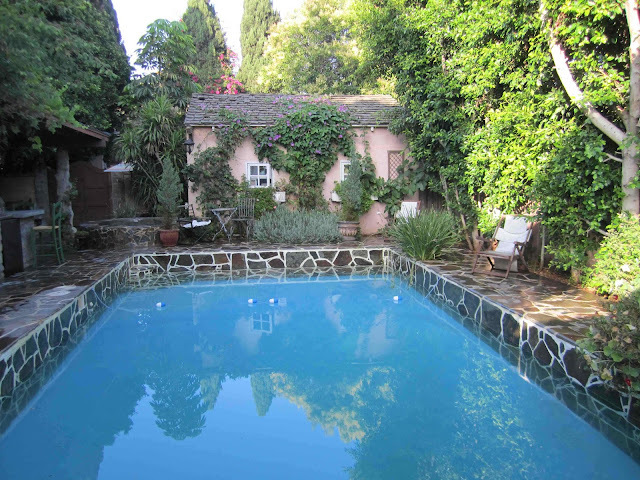 We're happy to report that this pool uses no chlorine. My engineer husband proudly consulted NASA scientists to perfect his "system," which employs mineral ions and ozone. It's got to be the healthiest, most eco-friendly freshwater pool in California. Yeah--no green hair! I'd show the real before shot if it wasn't packed away in the garage (sorry, that shot wasn't digital). Imagine cracked concrete, a ripped 1970s faded blue liner and a rickety fiberglass slide. We also added those cut little casement windows and window boxes on the back of the garage. This shot shows some of our challenges: Wolf's Creek flagstone tends to chelate iron, which stained the pool floor. Notice the many rust spots running into the pool. Ugh. Through trial and error (we had to paint the pool multiple times), we finally found a sealer that prevented any more ferrous streaks.